As a public issue, broadband has taken on a higher profile in recent months because of President Obama’s decision to include funding for broadband in the American Recovery and Reinvestment Act (ARRA). As enacted, ARRA included $7.2 billion for broadband with the goal of accelerating the deployment of broadband in the United States. Because of the increased prominence of broadband in public debate, this survey queried broadband users about the importance of broadband in their community and daily lives. The questions had to do gathering information about the community, as well as communicating to others, either about happenings around town, to government officials, or with health care providers. Users were also asked whether they see broadband as infrastructure important to economic growth. 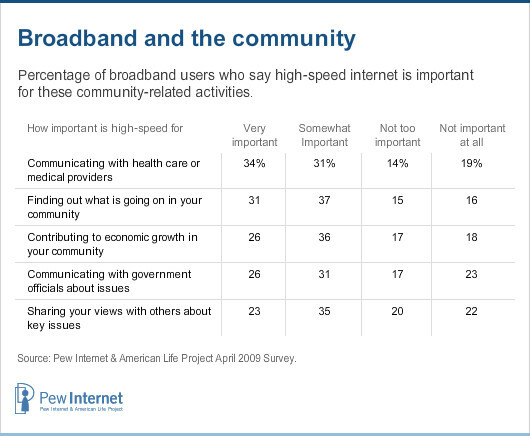 Most broadband users believe broadband is at least “somewhat important” for each of the five topics explored, with about two-thirds saying this about finding out about what is going on in the community and communicating with health care providers. Overall, 55% of broadband users cite at least one of the five items as “very important,” meaning more than half of broadband users view a high-speed connection as being very important to the civic or economic fabric of their communities. The 55% of broadband users who see high-speed infrastructure as very important differ in some ways demographically than their remaining counterparts who do not have strong views about broadband’s importance. The majority group of home high-speed users who say broadband is very important for at least one topic listed are younger than other broadband users (the median age is 39 for the “very important” majority versus 43 for the rest) and more ethnically diverse. Some 25% of those who see broadband as “’very important” in at least one way are English-speaking Hispanics (15%) or African Americans (10%) compared with 15% of other home high-speed users (10% Hispanic and 5% African American for that group).